When film-maker Karan Johar first saw the script for It’s a Wonderful Afterlife, he called it a mad, post-motherhood, hormonal effort. 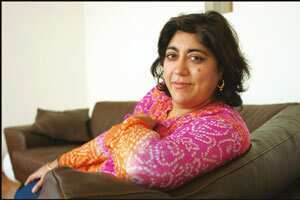 Fellow film-maker Gurinder Chadha, who co-wrote the script, couldn’t agree more. The 49-year-old mother of two-year-old twins—who has directed films such as Bhaji on the Beach, Bend It Like Beckham, Bride and Prejudice in the past—juggled family responsibilities and high expectations to turn that script of a “Punjabi ghost story" into a film which will release in April. At Johar’s suggestion, Chadha, for the first time, is making a film with an Indian production house, Studio 18. “The film is Capra-esque. It feels like a (Frank) Capra madcap comedy, which I think he would have enjoyed," says Chadha, alluding to Capra’s 1946 classic It’s a Wonderful Life. “The title of the film gives you access to its story and makes you smile. The twist of adding ‘afterlife’ gives it an Indian angle, suggesting reincarnation. There is, of course, a lot of pressure because I don’t want people to say that Capra would turn in his grave after this film." “I have made a few films with Punjabi weddings and realize that I could not do any more at the risk of repeating myself," she says, adding: “This is a supernatural comedy. I blend genres, culture and music. As my cousin puts it, the one word that describes my films is ‘inclusion’. Bend it Like Beckham, for instance, totally changed England. It made the British proud of the country they lived in." That film was a turning point for Chadha—audiences in India and overseas found the stereotypes in the film funny. It made money, propelled its actors to stardom and threatened to send Chadha into the Hollywood big league. She was roped in to direct the film versions of Dallas and I Dream of Jeannie, but both fell through. “I get scripts for Hollywood films all the time," she says, “but I will do one only when the cast, script and finance are just right. I could be making a whole lot of money in Hollywood without making any films because you just have to wait so long. Dallas fell through because the studio developed cold feet...Then I got pregnant and felt that maybe it was preordained. I prefer making my own quirky films." Her latest film has the usual mix of Indian and international actors, such as Sanjeev Bhaskar (The Kumars at No. 42), Jimi Mistry (The Guru, The Mystic Masseur), Mark Addy (Full Monty, Still Standing) and Sendhil Ramamurthy (Heroes). “You would not recognize Shabana (Azmi) in this film," says Chadha. “She could be sitting in a gurudwara in Southall and no one would notice her. She has transformed to completely fit the part of a Punjabi woman—with a three-stomach physique." Chadha now wants to make films that allow her to spend time with her children and she plans on continuing to work with husband Paul Mayeda Berges, who has been the writer-collaborator on many of her films, including It’s a Wonderful Afterlife. “Paul and I have been working together for 13 years, though he was involved less with this film because of the children," she says. “When he is writing, I take the back seat and vice versa. He does a lot of the hard work while I do the thinking."